One reason for MCD’s ytd underperformance might be expectations for EPS growth to meaningfully decelerate from last year’s 18% yoy gain to only 3% on an adjusted basis. 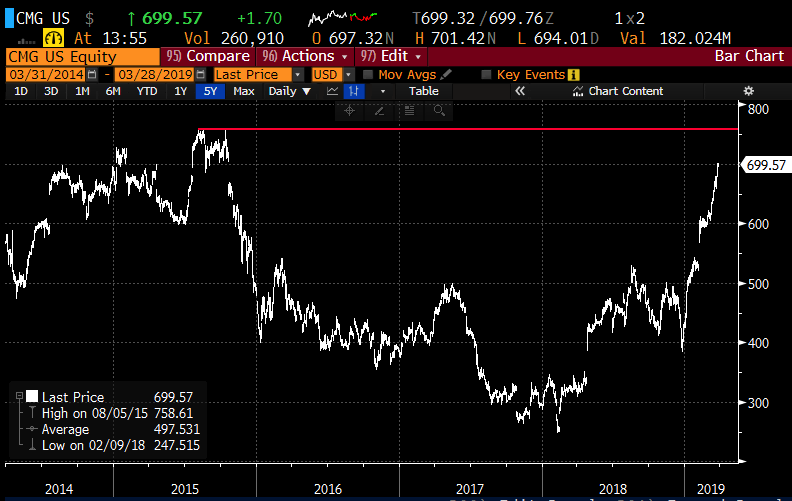 The stock trades at about 23x 2019 eps, which is near a 10 year high, and well above a market multiple, but below peers like Starbucks (SBUX) at 27x expected eps growth of 12%, Yum Brands (YUM) at 26x expected eps growth of 20%, Dunkin Brands (DNKN) at 25x expected eps growth of only 2%, DPZ at 27x expected eps growth of 11% and Chipotle (CMG) at 57x expected eps growth of 36%. So on a relative basis to its peer group MCD looks decently attractive on purely a P/E basis. Now let’s take a look at some of the charts and the ytd performance. 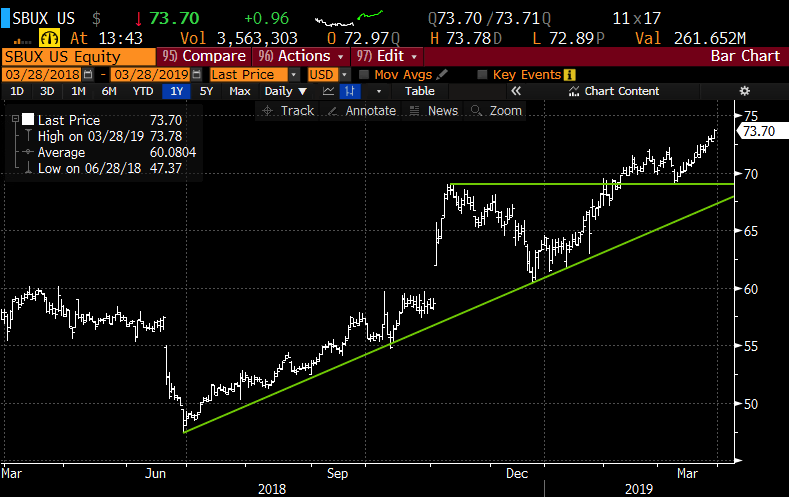 The next identifiable catalyst for the stock will be their fiscal Q2 earnings on April 25th and I would suspect that the higher the stock runs into it the more likely it is too re-test recent support on anything short of a beat and raise (think Nike last week). CMG does not report until April 24th, but this one seems priced to perfection. I see no reason to set up for earnings trades weeks prior to the event, especially vertical spreads that are trying to target a directional range, but calendars might make sense. 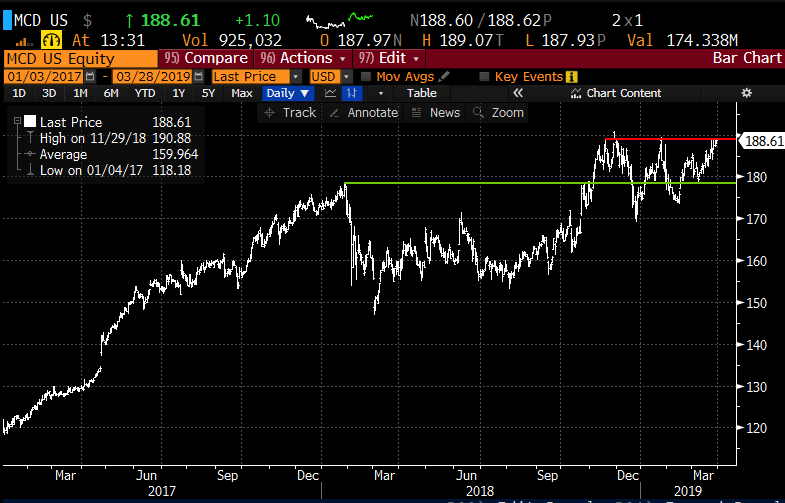 Let’s look at how we might target a stock like CMG, If earnings will come the week after April expiration, and I was inclined to play for a pullback after the stock’s sharp run, but also recognizing that the stock might have some more near term upside, we could look to sell a near the money put in April and use the proceeds to help finance the purchase of a May put of the same strike that would catch earnings. For instance, with CMG near $700, you could sell the April 700 put at $18 and buy the May 700 put for $42. If the stock were $700 or higher on April expiration, the April 700 put would expire worthless and I would end up owning the May 700 put for $24. Now this trade idea would keep you in the game assuming the stock does not rally too much above or below the strike prior to April expiration. 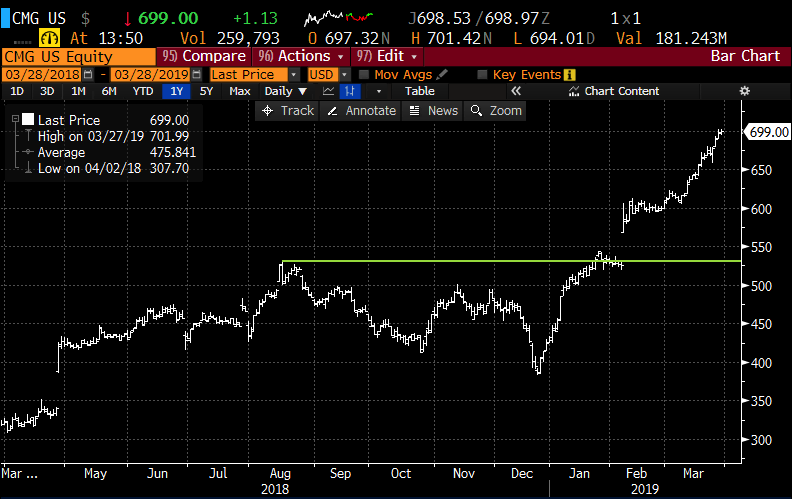 But again this is trying to thread the needle a bit and would really make the most sense if you thought the stock might consolidate some its gains prior to earnings after such a sharp run and that anything less than stellar results would send the stock much lower post earnings. 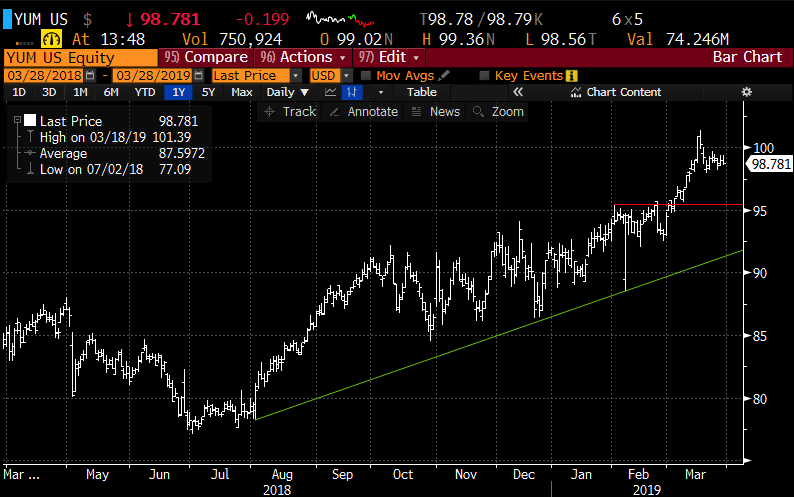 We will keep an eye on this space, as SBUX might also set up as a good candiddate to fade into earnings.